Of course I'm not beholding to Gus Grissle in any way, shape, or form. That's not why I'm for him for dogcatcher. Hell, Gus isn't even from my party, the Democratic party. He's a Republican, usually the kiss of death for me. Those bastards, I wouldn't be for them if they handed out half dollars on the square. No way. But Gus ... I know Gus ... and I know Gus is more or less good with dogs. So I'm for him. The fact of the matter is, Gus Grissle lives right up the street from me. On the other side of the Butlers' house. He drives by my place on the way to town or wherever, and he always waves. He's a good man, and if he says he can handle the dogs of our town, I basically believe him. He's more or less good with them. This is a tough endorsement for one reason, and one reason only. I don't know how many of you have noticed yet, but thanks to some grumbling, I've sworn off politics online completely, that is, under my own name. Facebook and here on the blog. I've found that friends are very high maintenance when it comes to politics, and they're easily disturbed. 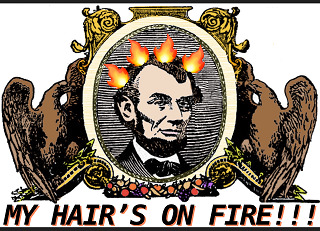 And I can be very quick with the insults, the put-downs on everything in the putrid Republican universe. Leading some of these idiots -- my friends -- to dislike me. Block me, whatever. So I'm out of politics. But ... dogcatcher? Surely even my namby pamby touchy-nerved wilting flower friends with their finger poised tremulously against the dislike/block button can't hold it too much against me for coming out for Gus Grissle for dogcatcher. Especially when they realize, this is the one Republican in the whole world I'm willing to endorse. Of course not for a job that is of any great value. It's dogcatcher. How bad could he screw it up? He's more or less good with dogs, I've seen how he is. 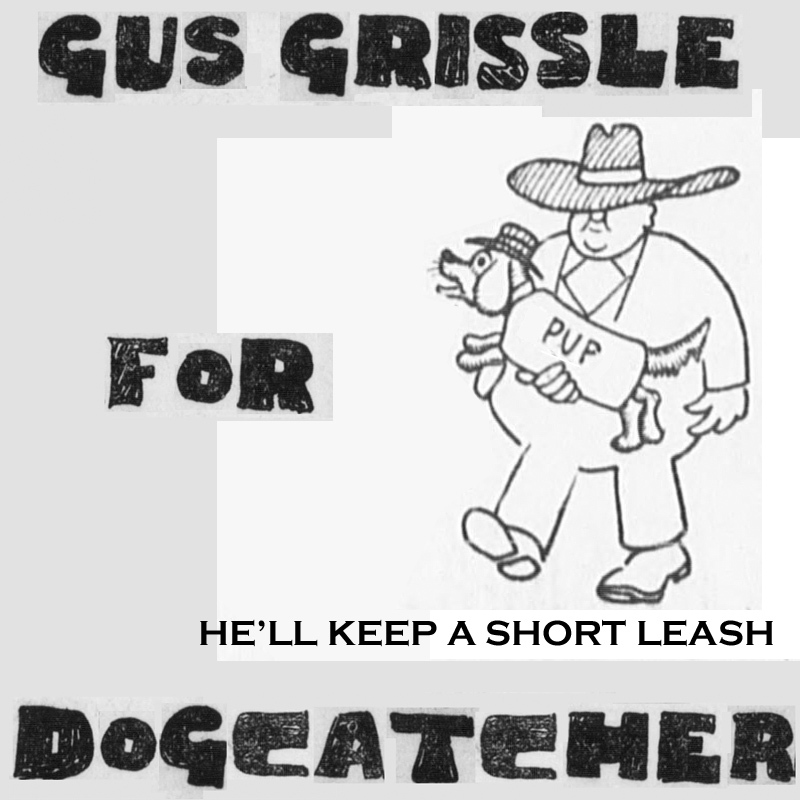 The job of dogcatcher came open when Merle Peaver died, and no one really wanted it, and Gus Grissle stepped forward. I'd say he deserves our respect for taking it on, and if he personally asks for my vote, being a neighbor and all, I'm not going to withhold it. People think dogcatcher's an easy job, but it isn't. You're not just chasing dogs till they disappear from sight. You've got them cornered, you're looking at snarling teeth and listening to a low growl. And this isn't your mother-in-law, they can't be tamed with chocolates. Then there's the whole modern situation with friendly dogs. 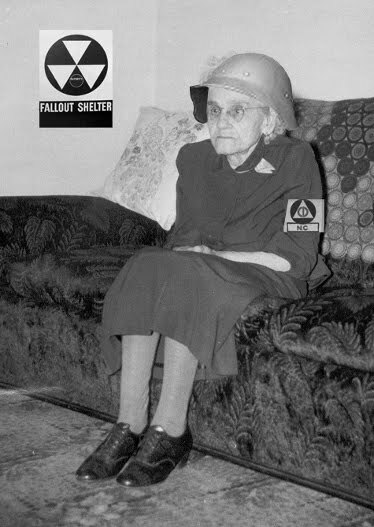 I know some of the dogcatchers we had back in the good old days. They were basically bag men. If a dog got loose, it was fair game. The law was the law. But that doesn't apply these days. Those guys are out. People baby their dogs now. Dogs are their babies. You try to bag one now and you're looking at being bagged yourself. That's how crazy people are. Don't write in, please, I like dogs. I'm just saying Gus is up against some regulations the old guys never faced. Anyway ... And have you heard of drug runner dogs? They're trained in anatomy. They're trained to go for the jugular. Drug runners use every dirty trick in the book not to be apprehended. For them, the more feral a dog is, the better. They come through on the interstate. The cops pull one over, the dog goes ballistic and tears the patrolmen apart, then they head for the hills. They literally could come up over that hill right there, just south of here, from the interstate, and take me down. Maybe Gus is thinking of that. He's my first line of defense. Those are the dogs that are very far removed from our cuddly ones. Or the higher class dogs like at dog shows. Do I think Gus would make a good dog show judge? No. He's more or less good with dogs, like I said, but to have to run his hand over their silky fur, then reach around and feel their bottoms, I can't see him doing that. Fortunately, that's not even in the cards. That's for someone else. 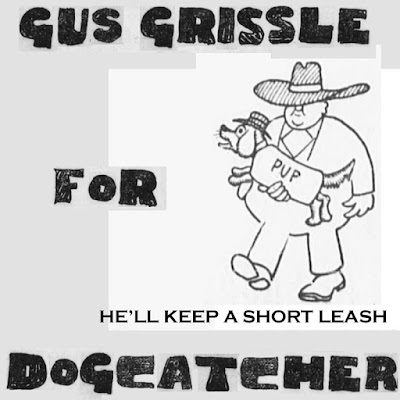 I guess I've probably given enough evidence as to why Gus Grissle would make a great dogcatcher. If you feel like crossing party lines and voting for a Republican, I know he'd appreciate your vote. Your vote, like mine, will be a token of trust in a good man, more or less good with dogs, who I believe can get the job done. Find the dogs, see that they get back to their owners. Or, if they're drug dogs, at the very least run them out of the county, and hopefully catch them and do whatever you do with a feral dog. Nothing good, I'm guessing.